Danica Patrick announced last year that she’d end her racing career with one more attempt at each of America’s biggest racing events, the Daytona 500 and the Indianapolis 500. A wreck just over 100 laps in at Daytona sent several cars spiraling, and eventually knocked Patrick out of her final NASCAR race. That white No. 9 car spinning like a top (is the appropriate phrase something about a fidget spinner these days?) from the front of the field is Chase Elliott, who was in second place when the No. 2 of Brad Keselowski got a run on him. 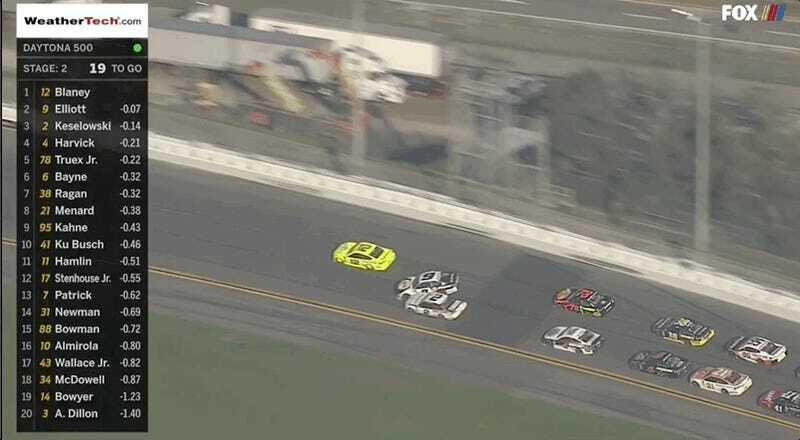 The run wrecked them both, sending Keselowski into a wall and Elliott spinning, collecting drivers like Kasey Kahne, David Ragan, Kevin Harvick and Patrick. With NASCAR’s new policy that mandates vehicles damaged in wrecks can’t go to the garage for a repair and come back out, the wreck ended the day for most of the drivers in its path. Patrick won’t finish her last Daytona 500. Patrick lost her full-time NASCAR ride with Stewart-Haas Racing at the end of last season after driving there since 2013. Monster Energy NASCAR Cup Series driver Aric Almirola, who brought sponsorship with him, took her former car.